Foot- and endnotes can be easily created in Papyrus. You can even have three or four on each page, all of which can be moved, formatted and added to as you choose. Footnotes, however, can’t be longer than a page and will not be split up onto multiple pages. 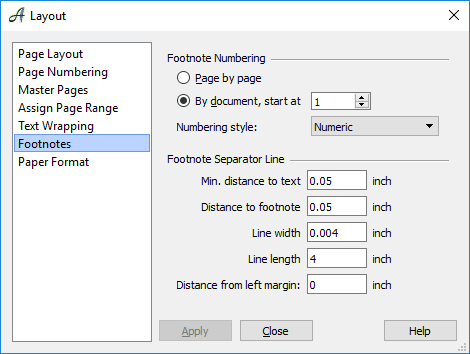 A footnote also cannot be changed to an endnote (and vice versa)–Papyrus can work with both foot and endnotes within one text, but you cannot change a footnote to an endnote or an endnote to a footnote. The “Footnote” function in the “Insert” menu will jump to the end of the page and allows you to enter a footnote for the point in the text where your cursor is located. You can get back to the main text either by clicking on “footnote” again or with the key combination + . Footnote numbering can either be done “ Page by page” and always start with “1” at the beginning, or “ By document” and start from a specific footnote number. To differentiate between end notes used in the same document, you can choose to display your footnotes with Roman numerals, asterisk, etc. The “Endnote…” Function in the “Insert” menu will create an endnote. The content of your endnotes is managed by a database which you have assigned to your document. Endnotes can be used independently and in addition to footnotes, meaning it is possible to use both footnotes and endnotes in one document. Endnotes are managed in a database belonging to your document. The first time you create an endnote in your document, an endnote database will be created based on the Papyrus template “Modules/Templates.predefined/Endnotes/Endnotes.pb”. 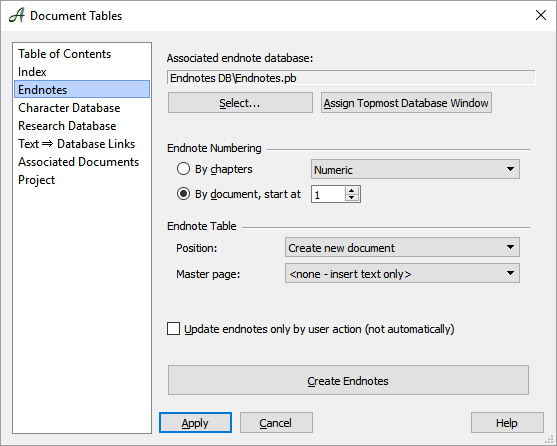 In the folder for your document, a sub-folder will be created with the name “Document Name Endnotes” that contains your endnote database belonging to this document. The “Endnotes” dialog (“Document” menu → “Indices and Directories” → “Endnotes”) allows you to link an already existing endnote database to your current document (useful if you have simply changed the name of your text document). The endnote database should only contain an entry field for the endnote itself, with the possibility for comments that will not appear in your main text. The button “create endnotes” will create the standard report for an endnote database and will give you a list of all your endnotes. You can choose to number your endnotes either “ by document,” which allows you to choose your start number, or “ by chapter,” which means the numbering will start at “1” at the beginning of each new chapter. You can choose different numbering styles here. And lastly, you can choose whether the endnote table should be inserted into the document itself and in what position. The endnote settings are similar to those for the Table of Contents. You also have the option to “update” the endnotes in the context menu.